Ermenegildo Zegna tie featuring printed stairs motif. Bigi tie in medallion-print. Approx. 3.1"W (8cm). Silk. Handmade in Italy. Bigi tie in small-floral print. Approx. 3.1"W (8cm). Silk. Handmade in Italy. 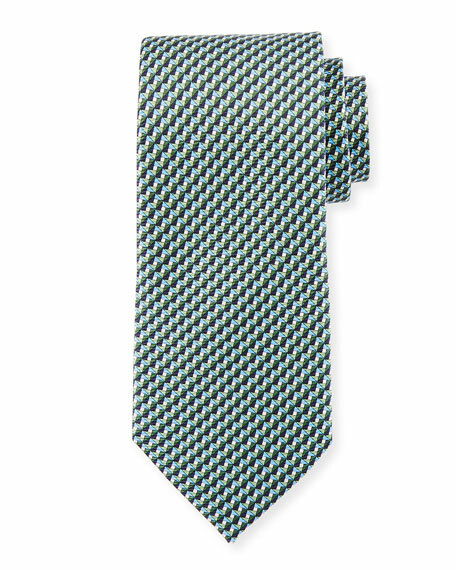 EXCLUSIVELY AT NEIMAN MARCUS Ermenegildo Zegna tie in basketweave motif. Approx. 3" at widest. Silk; dry clean. Made in Italy. Ermenegildo Zegna tie featuring micro-tic pattern. Approx. 57"L; 3.5" at widest. Silk; dry clean. Made in Italy.